Arnold Palmer yesterday blasted the US Senior Tour for refusing to consider the Senior British Open as a Major Championship. The King bowed out of the championship Royal County Down after a second round 75 that included a miraculous par five at the 18th. But like former champions Bob Charles and Gary Player, Palmer feels the Senior British Open should be recognised as a Senior Major. He said: "I'd like to see very championship to gain more of a prestigious stature than it has received. I think it deserves it. I think in the protocol of senior golf they have taken this tournament off the list of Majors and I don't think that's right at all. "I think the tournament deserves it but the operation of the tournament and the procedures they follow are part of the reason for that." The powerful US Seniors Tour refuses to co-sanction the British Senior Open or count prize-money earned at Royal County Down in the official US Senior Tour money list. Instead, the Americans only officially recognise the US Senior Open, the PGA Seniors, the Tradition and the Ford Senior Players championships as Senior Majors. But the 71-year-old King of golf feels that the British Senior event is getting a raw deal from his compatriots. "Part of the reason why I came over is to help give the championship its major status and there is no doubt in my mind that it should be listed as a Major. "If the event counted for the money list in the US then I'm sure more guys would come over just as Jack (Nicklaus) and I have come," he added. "I sure as hell would have something to say if I won it I'd sure be claiming it as a Senior Major and if Jack wins you can be real sure they'll definitely consider it a Major then," he said. Arnie's Army was out in force again yesterday and they got a thrill as the great man scorched over the perilous back nine in 34, two under par. And he couldn't resist a grandstand finish at the par five 18th to keep a bogey off his card on the back nine. Bunkered in two down the right, Palmer threw caution to the wind and fired his 165-yard bunker shot as far as the apron, pitched to six feet and holed for a popular par which drew the biggest roar of the day. But although the great man announced that he is phasing himself out of the game due to pressure of business and intends to eventually play only the US Masters and "lots of social golf", he may yet return to Royal County Down next year. Palmer said : "There's a possibility I'll come back next year. The hospitality has been so nice and the venue here is outstanding. I will certainly give it serious consideration. "I will be 72 years old shortly. I said when I was 65 that I would start curtailing my play and I have been doing that and will continue to do that. Maybe have a little more fun with my golf, which I enjoy so much." Palmer said that it is thanks mainly to his great army of supporters that he has gone on for so long. "Over the past 15 years if it hadn't been for the fact that the public have been so supportive I would probably have cut back sooner. As I said to someone yesterday, with all the adulation there has to be some humiliation and I had to suffer some of that yesterday." 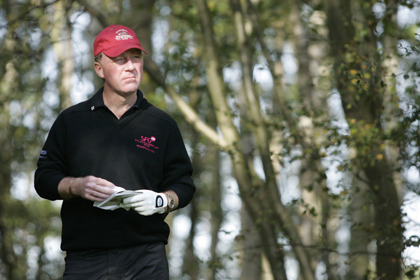 Three years ago he underwent an operation for prostate cancer, which kept him off the fairways for nearly three months. And he admitted yesterday that his lack of preparation for Royal County Down had cost him that disasterous opening 84 and his chance of making the cut. The seven-time Major champion said: "I really just didn't calculate the situation correctly. I should have been here no later than Tuesday morning, or probably Monday to get to know the golf course properly. "I hate shooting a score like that. It's what's going to make me give it up. I'm getting close but I need to play more competitive golf if I am to play the kind of golf I expect to play." He might have a ceramic hip and a dodgy leg but Golden Bear Jack Nicklaus still gunning for the only major title that still eludes him - the £500,000 MasterCard Senior British Open at Royal County Down. Three days of links golf have sparked the desire of old and the Bear is hungry to conquer the rugged par-71 track that demands an ability to negotiate high dunes, avoid more than 120 fiendish bunkers and calculate an astonishing 22 blind shots. His decision to take medical advice and rest a rib injury looks inspired now after he finished the opening day tied for second, just two shots behind leader Fred Funk, thanks to a four under par 66. Smyth turned in one-under 34 but came home in three-under with birdies at the 10th, 12th, 14th and 18th with just the one dropped shot at 17. "Four-under is a great round of golf," he said. "I'll take it any time. I'm not overconfident, I must be honest. I've had a long struggle with my swing and with my ball-striking. So I'm here, I've worked hard and I want to try as hard as I can. So I'm fighting it as I always do." Graeme McDowell is more worried about taming a US Open style Bay Hill than staring down Tiger Woods in the final round of the Arnold Palmer Invitational. McDowell on Woods' win - "I think he really just kind of nailed home his comeback"
Graeme McDowell had high hopes of spoiling yet another Tiger Woods comeback story but in the end he couldn’t lay a glove on the 14-time major winner in the Arnold Palmer Invitational. Ryder Cup hero Philip Walton turns 50 today insisting he’s grateful to get a second chance to revive his career on the European Senior Tour. The popular Malahide man has had a nightmare time since he lost his European Tour card at the end of 2005. But he’s full of hope again today and itching to make his debut alongside the golden oldies in the Mallorca Senior Open on May 11.